I was first introduced to the world of broadway musicals two years back, when I visted NewYork. Before that, the only musicals which I was familiar with were some movies like ‘My fair lady’ and ‘Casablanca’. I was thrilled and fascinated by the whole concept of the broadway musicals. The effort that goes into making a musical itself made it ‘wow’ factor for me. The actors, dancers, singers, chorus members, stage managers, musicians, directors, choreographers to stagehands, dressers, hairdressers, designers, box office personnel and ushers, work in unison to make the musical a success. New York city’s Broadway Theatre district is a popular tourist attraction. The Theatre district comprises of a lot of theatres hosting a variety of musical shows belonging to various genre like comedy, horror, romance, family, ectectera. Whenever I walk through the broadway street, I am fascinated by the huge billboards, bright lights and enormous theatres. Seeing a broadway musical was high on the things-to-do whenever I visited NewYork. First time, due to time constraints, I couldn’t get tickets for any of the shows other than Legally Blonde. I had earlier described that experience here. Next time I visited NewYork on work, I was adamant that I have to catch upon ‘Phantom of the Opera’. I had heard so much about the show that not watching it was not an option this time around. After many weeks of procrastination, I ventured out one fine morning to the streets of NewYork, to experience the musical. The weather was perfect; the streets were swamped equally with NewYorkers and tourists. It was a Saturday and by the time we could reach the Majestic theatre, we were late for the afternoon show by five minutes. I didn’t want to miss the show by even five minutes, hence we decided to spend the day in the city and watch the matinee show. We finalised on the Front Mezzanine tickets for the show. For the uninitiated, there are two types of tickets for a musical: Orchestra and Mezzanine. Orchestra tickets house the seats at the ground level and right in front of the stage and Mezzanine tickets house the seats at an elevated area. Yours truly had done some research earlier and had come to know that the Mezzanine seats give a better view of all the parts of the stage and the act. But this is purely a personal choice, I know many people who like Orchestra seats better. The show began sharp at eight and I couldn’t take my eyes off the stage even for a moment. 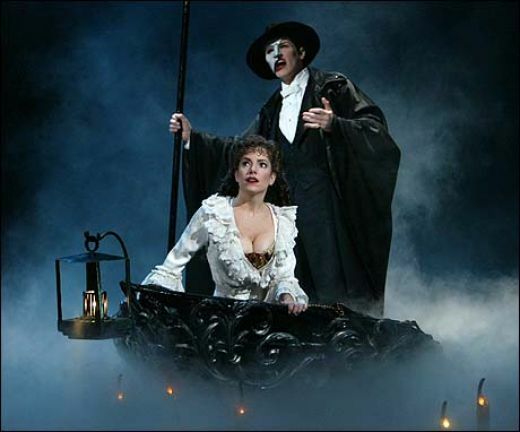 Based on the French novel, Le Fantom de l’Opera, this musical is the longest running musical in broadway. The theatre in which the show is hosted truly lives upto its name, it is indeed ‘Majestic’. With intricate work in its ceiling and walls and perfect lighting, the moment you walk into the theatre, you are captivated by the world of Phantom. Brilliant performances by all the actors, well co-ordinated orchestral music and enchanting sets makes the musical an out-of-the-world experience. The swiftness with which they change the sets and costumes, the technicalities that goes to bringing the light and sound effects together and the sheer brilliance of the whole act, mersmerises you for the whole two hours. A special mention to music by Andrew Webber which captivates you and keeps you on your toes at the same time. ‘Amgel of Music’, ‘Phantom of the opera’, ‘Music of the Night’ are just some of the soundtracks which brings this whole musical to its glory. The actor who plays ‘Phantom’ gives such a commendable performance that you sympathise with him, feel his agony and desperation, all throughout the musical. Christine and Roal also play their part to perfection, complementing each other. A must watch for anyone visiting NewYork, this show is by far the most visually appealing and enthralling experience of my life. I plan to go back for many more broadway musicals. Its a great experience. Do you have any broadway experience which you would like to share? Or any show that you recommend? your description is so beautiful that it will be the first thing that i would do if i ever get a chance to go to new yorkhere i come broadway!!! I once watched a musical called Zingara in gold coast Australia.. And that was amazing!!! A few months back, we watched 'Rakhtha Rakshassu' – not a musical, but the 'nadakam' is worth watching with brilliant stage arrangements, sound and lighting. There were scenes in which aeroplane lands, Maruti Alto speeds up through the streets etc. But the story and the cast were mediocre. @Madhu: I know, we have some commendable plays in India. Some of the notable ones I watched were 'Class of 84' in Mumbai and 'An Idiot for dinner' by Evam. Loved them too.